Weekly posts on educational topics, how-to-teach tips, parenting advice, kids health and more. Subscribe to the newsletter (on the left or below on mobile) for education blog updates by School is Easy Tutoring. When you hear the word “competition,” your thoughts may run to images from your childhood, winning the first-place match in a soccer tournament. Oh the ‘high’ that gave you! Or the race for the highest GPA to become high school valedictorian. And you may also remember the embarrassment of failing at certain competitions. So, is competition healthy in schools? Today, the idea of ‘competition’ in our schools is much different (and the Internet seems to be complaining about it, correlating it with everything that’s wrong with so-called ‘millennials’). When comparing your own competition memories to your child’s current reality, you may glance over a shelf full of ‘participation’ trophies and wonder if the competitive activities from your childhood could still hold a place in your child’s life today. Is it better to keep competition out of the way at school, so no one gets hurt? Or could competition be the key to unlocking even more of your child’s potential? It’s probably every parent’s dream for their children to be motivated at school all the time. According to the online education resource “Classroom,” competition can be a great way to motivate kids, by challenging them to put in their maximum effort. When children face competitive activities at school, they not only gain individual skills, like resilience and motivation, but they also build on important interpersonal skills. Parents.com states that competitive activities actually help students learn to let others have their turn, see things from others’ point of view, and build a strong character in spite of failure. These are skills that help prepare students for the workplace later in life. It also helps them succeed socially and academically in school. A positive, healthy competition in the classroom will help build students up, and engage them as they discover new skills. According to Parents.com, some signs of healthy competition include seeking opportunities to repeat the competition, developing new talents, desiring to improve, and experiencing higher self-esteem. Competition can easily lead to stress and anxiety, especially if it promotes academic competition between individual students. According to Classroom, this stress can force students to push back other interests and extracurricular activities, leading to an unbalanced life. A less-than-perfect result may affect your child’s emotions, or hurt their confidence. Unless you want each kid to be a winner in every competition, they will feel disappointed when they don’t win sometimes. Losing definitely isn’t easy! If a competition does not provide kids with a goal that is attainable for everyone, the activity becomes unbalanced, with some jumping ahead and others ending up left in the dust. This is the kind of competition that will lead to anxiety and a diminished desire to participate in related activities. An unhealthy competition may be one that is focused on winning, says Jessica Velasco of howtolearn.com, instead of honing in on learning a new skill or working as a team. These are the competitions that you may want to think twice about before incorporating into your classroom! Regardless of where you stand in your opinion of whether competition is healthy in schools, keep in mind there are many different forms of competition that can take place. Some are definitely more positive than others! Aim for competitive activities that involve setting attainable goals and encouraging teamwork. And of course, above all, keep students engaged and having fun. Stay tuned for more specific tips on how to implement healthy competition in the classroom! Kids fight. It’s human nature; we have disagreements all the time, even as adults. But learning how to handle each other’s differences is no doubt an important part of life. Tolerance can keep mankind working as a unit. And let’s face it: we’re social creatures. We need each other, kids need each other, and to meet that need, we have to learn to get along. So, how do you teach conflict resolution to kids? In this article, we’ll discuss some tips for doing so as a tutor, teacher or parent. So, follow-through may be needed, for when the lessons become applicable. When you read resources online for teaching conflict resolution to kids, you’ll see that most of them surround the real experiences kids are going through, or have in their memory. Thus, the subject requires application to be learned. But for a teacher, tutor or parent, having this ‘talk’ with your students can reduce the amount of time you need to spend as the ‘mediator’ or ‘judge.’ Petty fights among kids can cause them to lose focus on the more important lessons you’re trying to teach, or get the whole class through. You won’t want a bunch of annoyed, disturbed and outright angry kids in a classroom, causing more disruption either. And, as mentioned above, kids need these skills to survive on their own one day. Helping them act as independent problem solvers is a major goal when teaching conflict resolution. Whether paid or free, the Internet is of course, full of open educational resources you can use to develop lessons on conflict resolution with your group of kids. One way or another, parties who are angered by conflict need to find a personal solution. Whether that solution turns into violence and more fighting, or peace and resolution depends on how they handle conflict in the first place. Here we’ll ‘steal’ a chapter from psychologists who use the practice of Cognitive Behaviour Therapy (CBT). CBT is a method that explores how someone feels, thinks or acts, and the reasons why. It then helps them identify solutions to those problem tendencies, for long term change. When dealing with anger, CBT is a researched, established method for making a difference in someone’s life. To use a colloquial description, think of CBT as a way of ‘retraining’ the brain. So, why are we bringing this up? Because, conflict resolution requires a way of thinking and looking at a problem that goes beyond the initial feelings of anger. To do this, you have to challenge yourself with questions. And the more people in a situation of conflict that are willing to do this, the better. For example, see how this site, dedicated to conflict resolution, presents questions for conflicted parties to ask themselves. Questions include even first asking if a person wants to resolve a conflict. And then, it goes deeper to next steps, such as finding a fair, negotiable compromise. This type of conflict resolution is a trait to be learned, as seen on the aforementioned site’s summary of skills on this issue. For example, asking the kids in your class to focus on the positives, instead of the negatives. For this, they need to first see how conflict can be turned into “creative opportunities.” They also need to dig deep to find out if perhaps, the conflict arose because of unapparent ‘seed’ issues (like, perhaps they are truly angry about something else, or very tired, or ‘hangry’). In this relationship worksheet for conflict resolution, angry parties learn skills like focusing on a problem, instead of a person. They also learn to communicate better, so they don’t further exacerbate a problem. Our experiences can tell us that most of the time, people aren’t ‘born’ to handle things this way! When teaching conflict resolution skills to kids, you’ll come across a lot of vocabulary surrounding the subject. These one-word lines can be useful memorization aids, to give kids a ‘toolbox’ of ideas to apply when they encounter conflict in the future. You’ll find these on the aforementioned articles we’ve linked to. They include words like “negotiate,” “arbitrate,” “litigate” and “mediate.” Depending on how old the kids are which you are teaching, you may want to start with vocabulary definitions. This can also be a way to ease-in to the topics of asking students to define situations when they could use those strategies. Finally, as a concluding word, we should mention that our teaching kids of conflict resolution should come with good examples for them to follow. The skills taught above are knowledge-based. But most of this topic involves experience, as we’ve mentioned earlier. And so, while you can teach kids any number of facts, eventually it can come down to what they see and model around them. The good news is that since conflict resolution is a skill, and not a natural-born talent, there is hope for all of us! A spelling bee contest in Canada sounds like a lot of fun, doesn’t it? While we may have watched them in American TV shows, they do in fact happen across Canada, and Canadian kids attend these spelling competitions in the U.S. In case you didn’t know, Canada’s ‘big’ spelling bee competition is run by the 30-year-old, Toronto-based non-profit, Spelling Bee of Canada (and it has regional competitions too). So what makes spelling bees fun in any country? Kids get to show off their ability to memorize the spelling of words, and achieve status at the end. Parents are proud, and popularity is won! Or is it that appealing? Some may argue that there are cons to spelling bee contests, just as there are pros. In this two-part article, we’ll debate the question of whether children should join a spelling bee contest. Of course, Canada bears two official languages: English and French (in addition to some unofficial First Nations languages, which we should also credit). We’ll be covering English spelling bees here. English is a tough language. Vocabulary development takes practice, and memorization techniques. As this article in The Atlantic explains, English is not as orderly or sensical as other languages. It’s a mish-mash of words from different languages, and with different spellings that evolved over many years. That article posits the ‘illogical language’ fact as a con to learning. However, one could also argue that events like spelling bees are conducive to making word-learning a fun, challenging activity. In the lead up to the 2017 national spelling bee contest in Toronto, the CBC also reported on parents and participant’s attitudes towards the benefits of spelling bees. One child was entered into the game to overcome stage fright, and to be able to learn to interact with peers. It worked! Reflecting on an 1988 competition, a winner testified that the experience helped build her confidence. Plus, at least where U.S. spelling competitions are concerned, the prizes can be extensive for winners. This can show kids the result of dedication to perfecting a skill, and the rewards that could result. This point may be one that some can argue around. But it is notable, and noted by multiple journalists, that winners of spelling bees lately are dominantly from India or South Asia (or have that heritage as Canadians and Americans). The aforementioned CBC article stated that 14 of the past 18 winners in America were Indian. This author even compared the Indians’ skill in spelling to that of running talents among Ethiopians and Kenyans. So, could this be a way to let the South Asian community shine? There is another side to spelling bee competitions! Our Canadian kids may not all be suited for spelling bee contests, and parents and teachers may disagree with their existence altogether. Stay tuned for our next article in this series, outlining some cons of spelling bee competitions. We’ll bet that when Disney came out with the movie, The Queen of Katwe (or if you read the book earlier), kids everywhere must have been inspired to pick up the board game of chess as a hobby. And it’s always great to teach kids a topic they’re interested in. Surely, learning chess has a lot to teach about strategy, life and mental exercise. But there’s another timeless game that’s just as old as chess, with more to give. Ever thought of teaching backgammon math lessons to your pupils? Below are math ideas you can teach kids by playing backgammon. This can be as simple as learning how to add up two numbers. But it can also show how a limited set of numbers can create many possibilities of combinations. 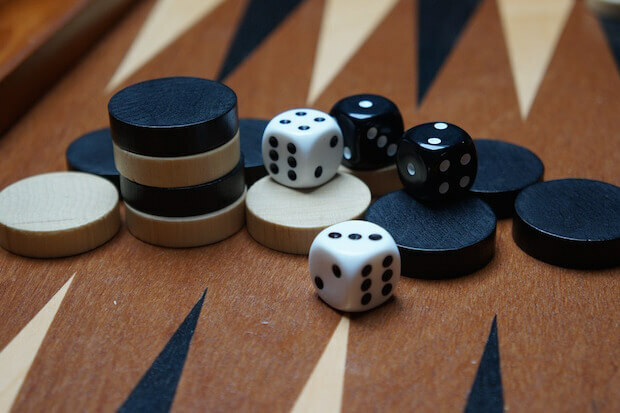 This resource teaches backgammon dice statistics, moves, and odds in great detail. You see, math is not useless! When you roll two dice instead of one when playing backgammon, your mathematical probability changes. As this article also explains so well, calculating probability in backgammon can show kids a strategy for determining possible outcomes. In fact, it’s a great simple way to start teaching math probabilities, or to introduce the application of fractions. They can use this information to make decisions about where to move their checkers on the board, in order to win. Along with doing calculations in the head, backgammon players also learn memorization skills. As the above author explains, the more you know about how backgammon math works, the easier you can make general estimates on the fly. This is also a math skill, and a life skill for kids to learn. Once they learn principles, they can learn to apply those principles in multiple situations. Isn’t that what math tests are all about? We’ve covered only a few of the math skills used in backgammon. However, backgammon math is so interesting and applicable to math theory, computer scientists have even studied it! And, as this article delves into it, you can see there is more to it, which can turn into advanced math lessons for your students. In life, this game can teach that while ‘luck’ can explain some things, strategy can be applied to improve your odds.